KEEPING CHRISTMAS March 2019 Inspirational Blog Hop!!! Good morning and welcome to the Keeping Christmas Inspirational Blog Hop! Where you find wonderful ideas for Christmas cards and projects. On the 25th of each month we will be sharing our Christmas creations. 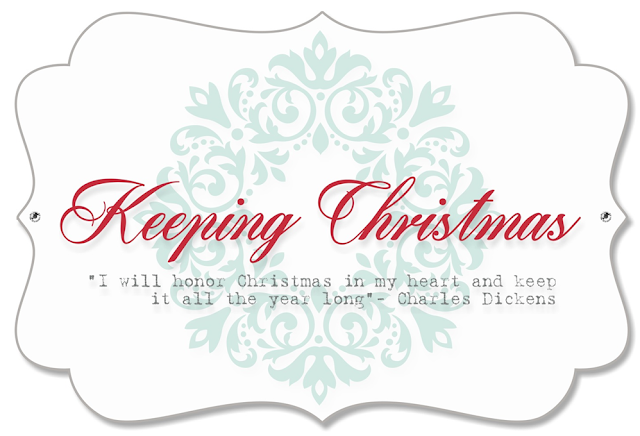 Our host each month is Kelly Lunceford, the creator of Keeping Christmas. This month I created a Christmas card box that contains 5 cards using Prima, Santa Baby paper and journaling cards. I made the box using Betsy Veldman's Make-it-Market kit, A Fairy Tale Christmas. In one of her videos for this kit she created a card box. This box is large enough to hold cards and envelopes that are 4 1/4 x 5 1/2 inches in size. On the outside of the cover I used the Santa Baby paper and Papertrey Ink's Big Basics: Merry Christmas die. I used scarlet jewel cardstock, 2 layers and covered it with glossy accents. The ribbon is also from Papertrey Ink. I used weathervane cardstock for the base of my box. I also decorated the inside with Santa Baby paper. Papertrey Ink challenge Laurie's Fabulous Favorite! Hello! Over at Papertrey Ink they are have a challenge going on and it's called Laurie's Fabulous Favorite! This week she is challenging us to make a card or project using our favorite accessory! I do have a few but my all time favorite is buttons, I love the home spun feeling! 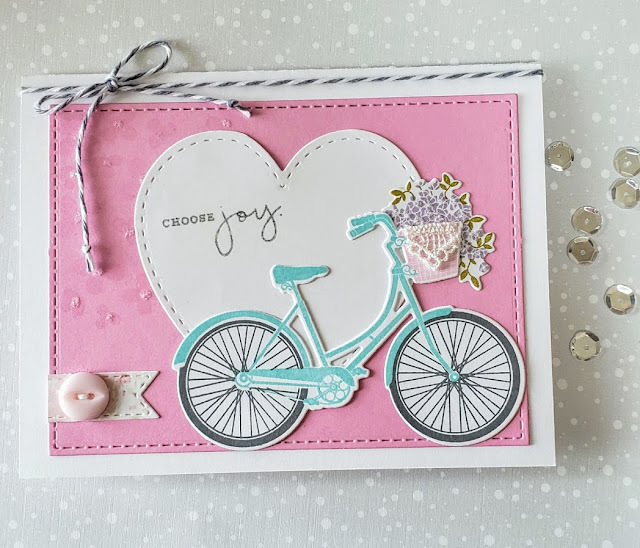 On my card today I have used Noted Simply Stitched Vertical Die, You Have My Heart Die, Petal Pushers Stamp and Die, Quilted Die, Choose Joy Stamp and 2018 Anniversary set Mixed Bouquet! I have used twine, lace, glitter, I embossed the sentiment and of course I added a button:)! I hope you take the time and enter the challenge. KEEPING CHRISTMAS FEBRUARY 2019 INSPIRATIONAL BLOG HOP!!! Good morning! It is close to the end of February and we are getting our fair share of SNOW, which I love!! Today I'm sharing with you my project, a Christmas recipe book! I thought it would be nice to have a place to hold the recipes that we use at Christmas time for our family dinner. The designer paper is from Graphic 45, the St. Nicholas Collection. On each of the pages there is a pocket that holds a tag or two. I will be writing the recipe on the back of the tags. If the recipe is too long then I will just place it in the pocket. The book has ten pages. Take a look at the images below for a peak inside. Papertrey Ink's challenge #2 Laurie's Fabulous Favorites! Hello! Today I am entering this card in Laurie's Fabulous Favorites challenge #2 over at Papertrey Ink. I know it is a Mother's Day card but it is nice to get them done early. 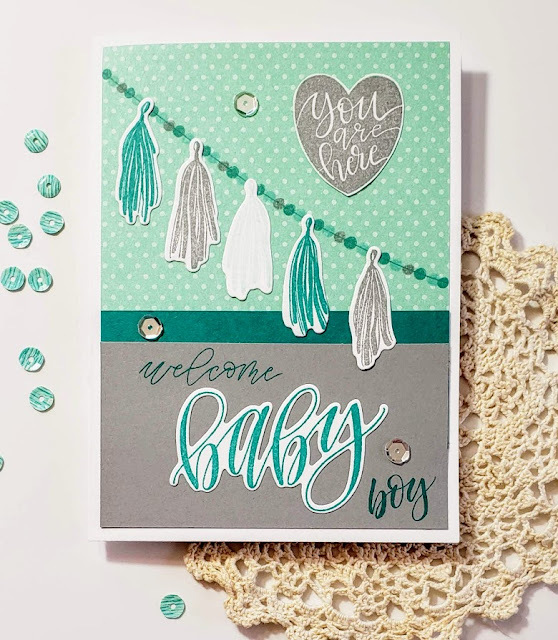 Laurie's challenge is using your favorite color card stock and my is Lovely Lady. I used Fresh Bouquet stamp and die set, Limitless Layers 2 1/4 hearts die, Scallop Stackers large die and the sentiment is from February Monthly Moments. Hello, I am excited to do this challenge for Papertrey Ink and entering it in the Make it Monday #346 2018 A LA Carte! Lizzy Jones did a M-it-M challenge #330 Repeating the Greeting, so I choose that one. 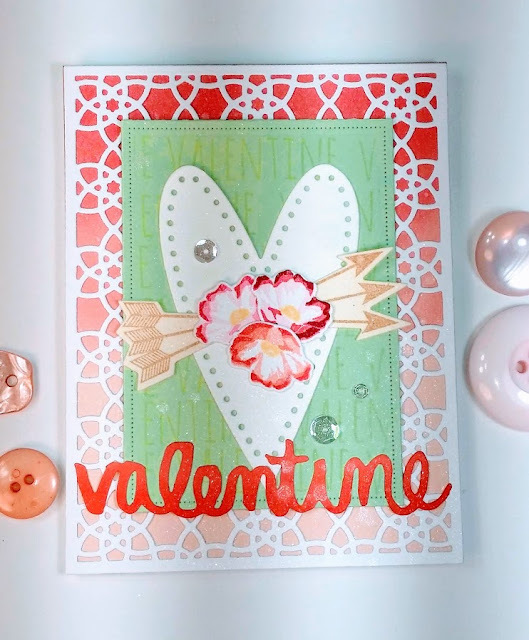 I realize it is a little hard to tell that I repeated the greeting but I did and it says valentine using the stamp set and die XOXO. I used Mint Julep paper and the same ink repeating the sentiment. The background die is Bold Borders: Prism, slightly covering it with Pierced Feature Frames Die in Mint Julep cardstock. Over the Stitched Heart Die I placed Cupid's Arrow Stamp and Die and the Lovely Farmers Market Floral's Stamp and Die. 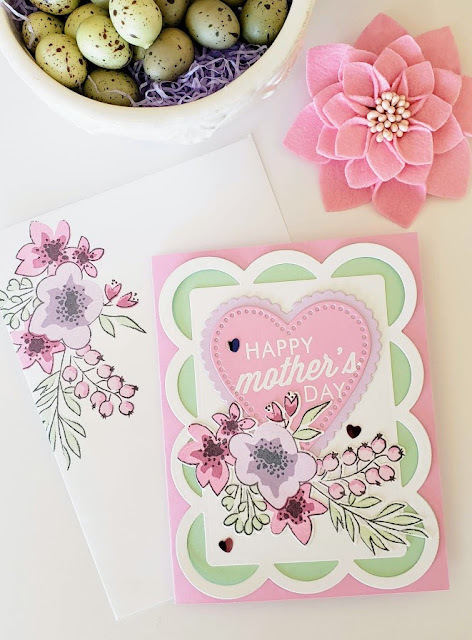 The die cut sentiment is berry sorbet cardstock, inky the bottom half with the same ink color. I felt it didn't have enough shine so I sprayed it with Glimmer Mist, pearl and added a few sequins.